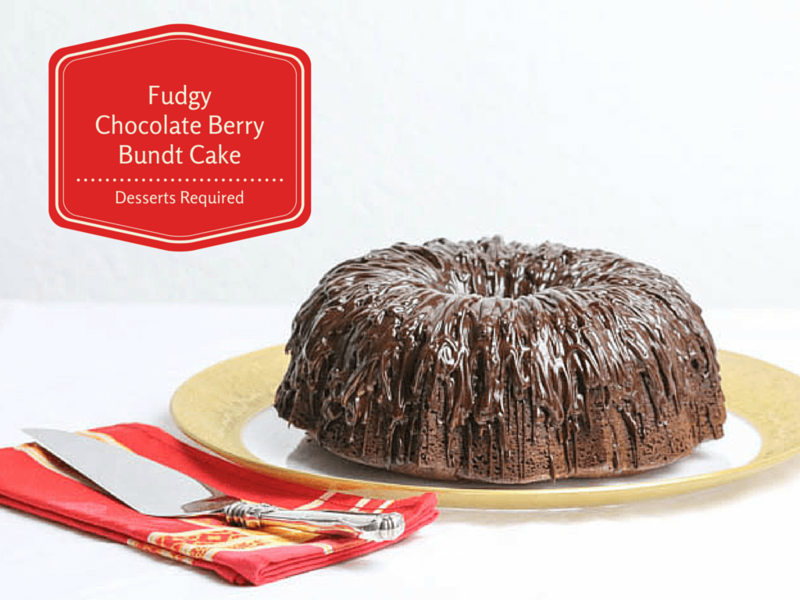 The chocolate glaze was spread onto this Fudgy Chocolate Berry Bundt Cake. What’s not to love about this week’s Sunday Supper theme, Memorable Holiday Meals and Traditions? It is, absolutely, perfect for this time of year. Plus, we are fortunate to team up with Gallo Family Vineyards to enhance our holidays even more. I asked my kids what some of their favorite memorable holiday meals have been and, even though the answers varied, the bottom line was that they shared a common love of homemade desserts. It was hard for them to choose only one because several desserts accompany each holiday. 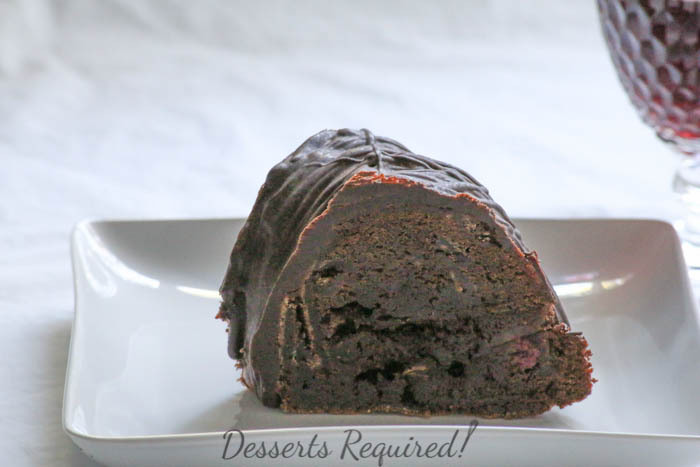 The chocolate glaze was drizzled onto this Fudgy Chocolate Berry Bundt Cake. I received Gallo’s seasonal wines and had a difficult time deciding which I wanted to complement, first. The Holiday White Blend has hints of crisp green apple and sweet caramel. I, immediately, thought of an Apple Cranberry Pie with a caramel drizzle. Yet, it was the Holiday Red Blend that won out with its hints of juicy berries and chocolate. I bet Gallo had me in mind when they came up with this combination. I knew, immediately, that I wanted to bake a Fudgy Chocolate Berry Bundt Cake . Actually, I could call this one a triple Fudgy Chocolate Berry Bundt Cake because it includes cocoa powder, melted chocolate and chocolate chips. With two cups of berries (I used raspberries and blackberries) I had to be sure that the ingredients worked harmoniously, just like those within Gallo’s Holiday Red Blend. The end result is a cake that is certain to be memorable at your holiday table and, who knows, perhaps it will become one of your family traditions, as well. Whisk the flour, baking soda, cocoa powder and salt together in a small mixing bowl. Set aside. Cream the butter and sugar until light and fluffy, about 3 minutes, scraping the bowl down as needed. Add the eggs, one at a time, until combined. Mix in one-half of the dry ingredients and then add the vanilla and sour cream. Add the remaining dry ingredients. Blend in the melted chocolate followed by the chocolate chips. Remove the bowl from the mixer and fold in the berries. Spray the bundt pan with non-stick cooking spray. Pour the batter into the pan. Bake at 325˚ for 1 hour. Cool the cake completely in the pan. In a small saucepan over medium heat melt the butter with the cream. When it starts to simmer, turn the stove off and add the chocolate chips. Stir until the chips are completely melted. Allow the glaze to sit for 5 minutes. Invert the cake onto a cooling rack. Place the rack over a piece of wax paper to catch any glaze that drips off the cake. There are two ways to glaze this cake. The first is to pour ½ of the glaze over the top of the cooled cake. Spread with a small metal spatula so that the glaze drapes down the sides of the cake. Add the rest of the glaze and drape some more. The second option is to transfer the glaze to a quart size plastic freezer bag. Cut a small piece off one of the corners. Squeeze the glaze back and forth over the cake. With either option, the entire cake will not be covered with chocolate glaze. Be sure to check out Gallo Family Vineyards store locator that spares you from driving all around in search of the perfect wine. Don’t forget to get your $1 off coupon, as well! Many thanks to Isabel Reis Laessig from Family Foodie for doing such a great job hosting this week’s Sunday Supper. 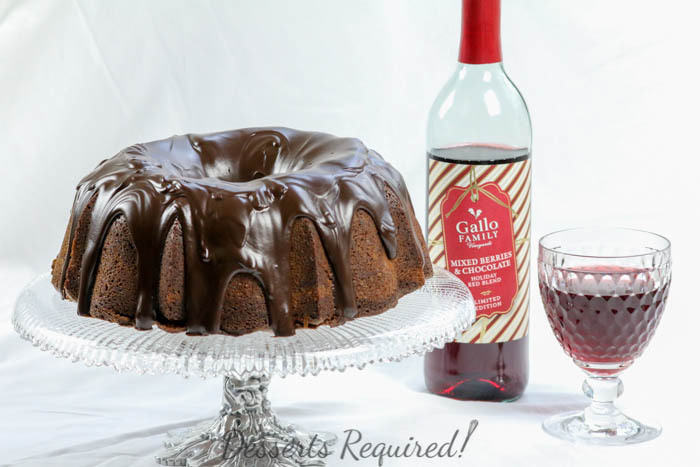 Please be sure to check out all of the wonderful Gallo Family Vineyard Giving Comfort recipes that my fellow Sunday Supper family members have made. SO rich, so dense, so irresistible! I love the look of this cake, Betsy…I hope you saved me a slice!!! You had me at seeing the word fudgy and then seeing the slice just totally got me. Wow! What a rich and wonderful bundt cake! Thanks so much, Renee! I love fudgy desserts and baking in the bundt pan makes everything pretty. Holy Crappers! I am sooooooooooooooooo drooling over your cake! It looks amazing and that chocolate over the top looks to die for! You CRACK me up!!! I love your comments. Thank you! You are so sweet. Thanks so much! Wow!!! This cake is the kind I like best with how moist it is and filled with berries. Absolutely perfect for the holidays, or really year round !! You summed this one up, beautifully, It really is great year round! Consider me dead. Because that cake looks like the best “death by chocolate” EVER! Yum yum and more YUM!!! That cake looks sooo chocolaty and good!! I wouldn’t be able to stop ay one piece that is for sure!! With you as their mom, of course your kids think homemade desserts are the most memorable! You make amazing ones like this. I don’t like chocolate cake unless it is super-fudgy, and this looks like it’ll fit the bill! Thank you very much for your comments. I love super-fudgy desserts, too. Everyone needs a fudgy chocolate berry bundt cake in their lives and this one looks absolutely amazing! Oh my!! Death by chocolate with a big smile on my face 🙂 What a beautiful and delicious dessert!! I like the addition of berries, but it’s kind of hard to get here raspberry and blackberry. Can I use sour-cherries?? I think sour cherries would be divine!! Please let me know how it turns out. You are so sweet! Thank you. I have to work on that Apple Cranberry Pie with Caramel Sauce. Now I have a craving!! 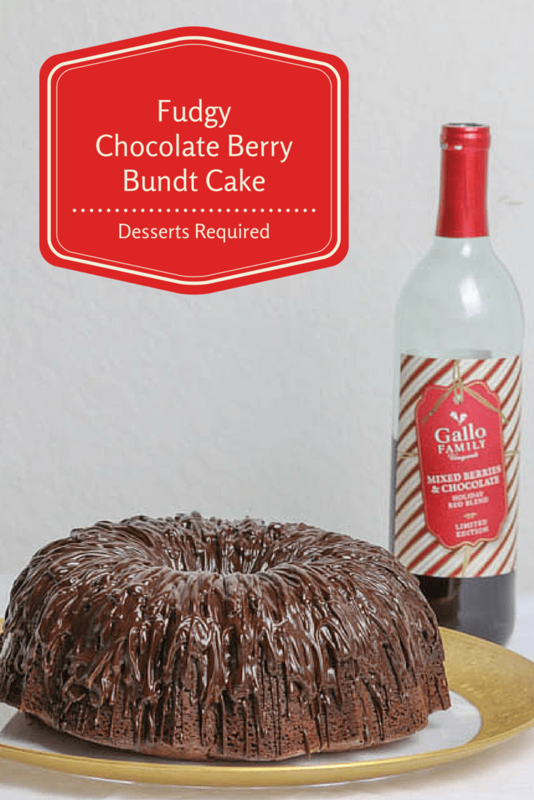 I’m glad you went with the fudgy bundt cake idea! Love it! Thanks so very much. I love the fudginess of this cake and the berries complement the chocolate, beautifully.